Wow, Fiber Plus Powder Apple by Yerba Prima works I did not take it as much as they said but it was easy on my system. Support digestion and healthy bowel movement with Fiber Plus® Powder Apple – 12 oz (340 Grams) from Yerba Prima®. 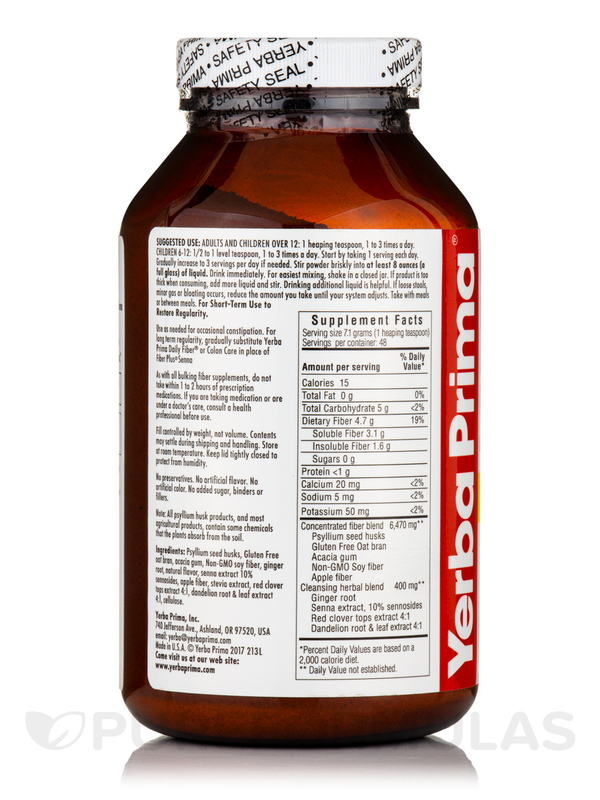 This dietary supplement provides natural fiber‚ calcium‚ sodium‚ and potassium to your body. 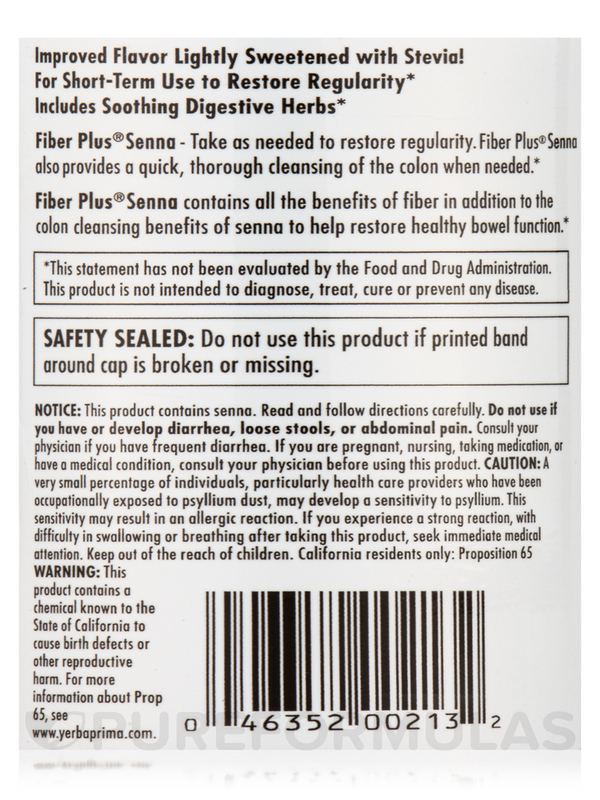 Concentrated fiber blend‚ containing psyllium seed husks‚ soy fiber‚ acacia gum‚ oat bran‚ and apple pectin‚ reportedly softens stool and moves feces out of your intestine. This blend may also improve your digestive system function‚ curb appetite‚ and help you shed those extra pounds. It could potentially alleviate blood glucose levels‚ reduce low-density lipoprotein and triglycerides in your body‚ and keep away heart conditions. Studies reveal that extracts of ginger root‚ red clover tops‚ dandelion‚ and senna in purifying herbal blend promote gastrointestinal health. 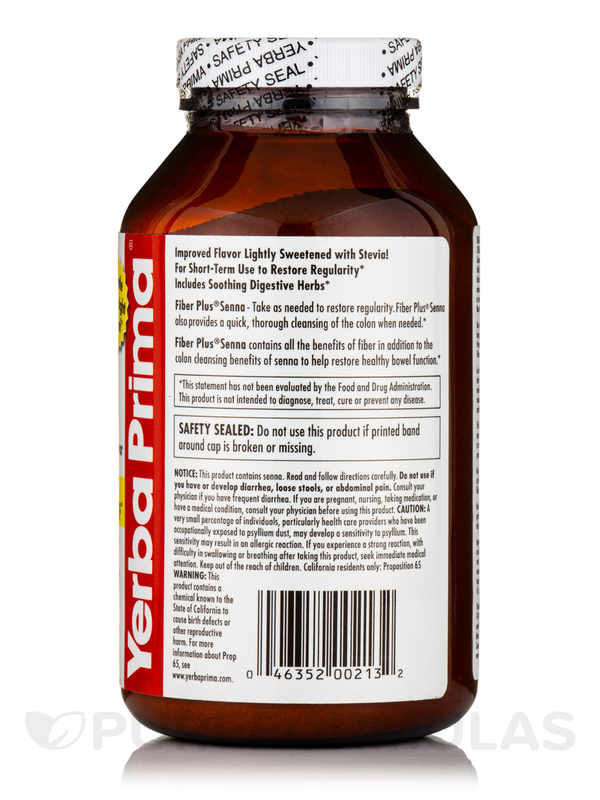 While ginger in this dietary supplement from Yerba Prima® could potentially soothe your digestive tract and ease stomach problems‚ red clover tops may aid digestion and support heart healthy living. Dandelion reportedly improves appetite‚ prevents the formation of gallstones‚ increases urine output‚ and cleanses colon. 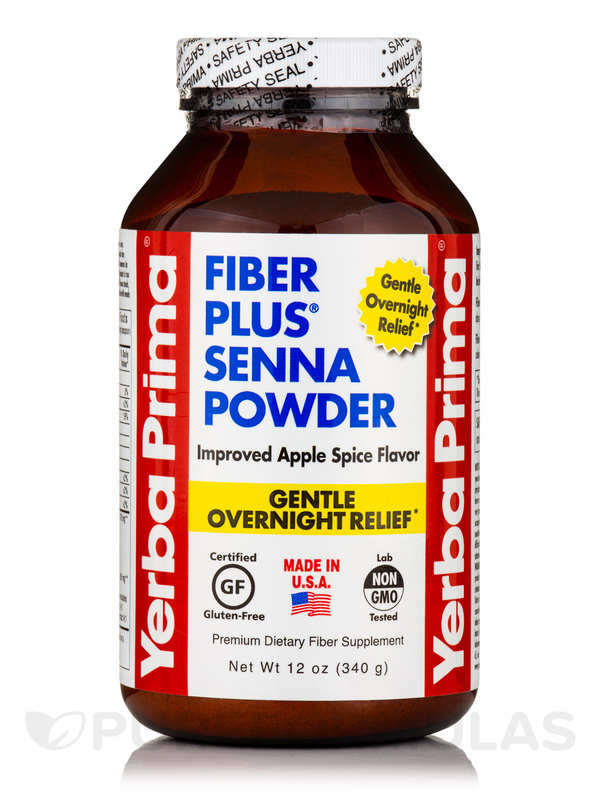 Harboring the benefits of a chemical called sennonides‚ senna extract in Fiber Plus® Powder Apple – 12 oz (340 Grams) from Yerba Prima® helps promotes weight management. Psyllium seed husks‚ gluten-free oat bran‚ acacia gum‚ non-GMO soy fiber‚ apple fiber. 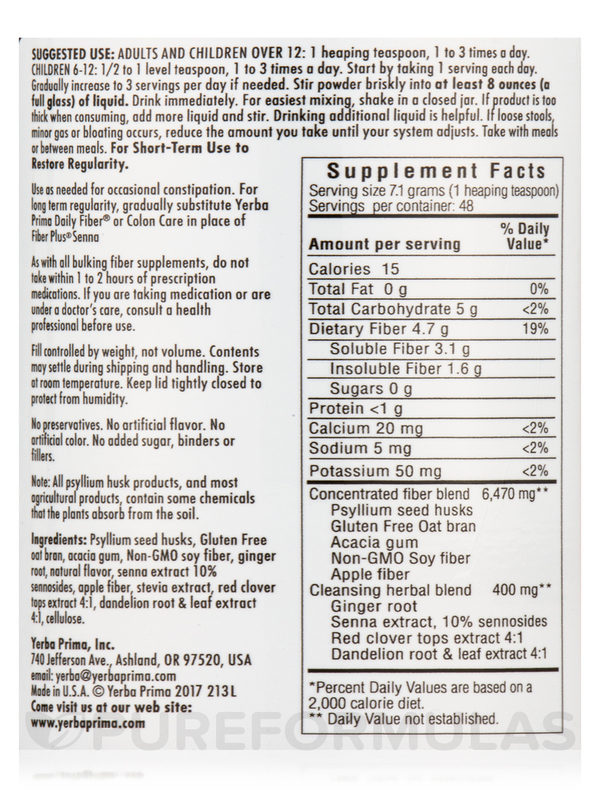 Ingredients: Psyllium seed husks‚ gluten free oat bran‚ acacia gum‚ non-gmo soy fiber‚ ginger root‚ natural flavor‚ senna extract 10% sennosides‚ apple fiber‚ stevia extract‚ red clover tops extract 4:1‚ dandelion root and leaf extract 4:1‚ cellulose. Gluten-Free / Non-GMO / Made in USA. Start by taking 1 serving each day. Gradually increase to 3 servings per day if needed. Stir powder briskly into at least 8 ounces (a full glass) of liquid. Drink immediately. For easiest mixing‚ shake in a closed jar. If product is too thick when consuming‚ add more liquid and stir. Drinking additional liquid is helpful. If loose stools‚ minor gas or bloating occurs‚ reduce the amount you take until your system adjusts. Take with meals or between meals. This product contains senna. Read and follow directions carefully. Do not use if you have or develop diarrhea‚ loose stools‚ or abdominal pain. If you are pregnant‚ nursing‚ taking medication‚ or have a medical condition‚ consult your physician before using this product. A very small percentage of individuals‚ particularly healthcare providers who have been occupationally exposed to psyllium dust‚ may develop a sensitivity to psyllium. This sensitivity may result in an allergic reaction. If you experience a strong reaction‚ with difficulty swallowing or breathing after taking this product‚ seek immediate medical attention.